Thyro-tabs (levothyroxine sodium, USP) is a synthetic thyroid hormone in veterinary medication mainly for use in the management of conditions related to hypothyroidism in dogs. Hypothyroidism occurs when the gland does not produce the required quantity of thyroid. When applied into animal’s body, Thyro-tabs supplies thyroid hormone, which will quickly relieve symptoms caused by hypothyroidism. The medication has shown proven results in treating the medical symptoms caused due to thyroid related autoimmune diseases. However, the condition might demand prolonged or even lifetime treatment to ensure better results. What is Apex Thyroxine used for? Apex Thyroxine Tablets 0.4mg are used to treat hypothyroidism in dogs, a condition in which the thyroid gland does not make enough thyroid hormone needed to regulate growth and metabolism, and in dogs is usually due to atrophy of the thyroid gland. Hypothyroidism in dogs usually occurs in older dogs or younger dogs of larger breeds; also neutered dogs. Symptoms of hypothyroidism in dogs includes loss or thinning of the fur, dull hair coat, increase shedding of hair, weight gain, lethargy, reduced activity, increased sleeping and reduced ability to tolerate the cold. Other symptoms include thickening of the skin, increase susceptibility to skin infections and drooping face muscles. Apex Thyroxine Tablets 0.4mg are a hormone replacement therapy for dogs that will restore your dog’s hair coat, improve your dog’s skin condition, and help restore your dog’s energy, weight, strength and general wellness. How does Apex Thyroxine work? Apex Thyroxine Tablets 0.4mg contain thyroxine that is identical to the naturally occurring thyroid hormone thyroxine or T4, produced by the thyroid gland. 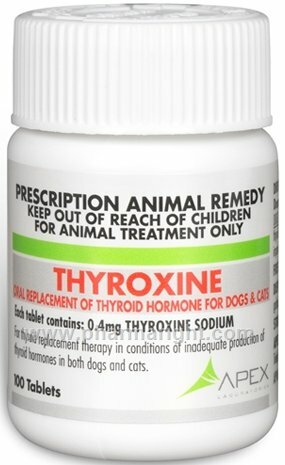 Thyroxine (T4) in Apex Thyroxine liquid is converted to the more active form of thyroid hormone (T3) which interacts with a specific receptor inside cells to stimulate proteins needed to manage and regulate a variety of processes including how your dog’s body regulates temperature, metabolises nutrients and controls growth and development. The overall effect of thyroxine is to Increase rate of metabolism. Thyroxine in Apex Thyroxine liquid also regulates the production of another hormone called thyroid stimulating hormone (TSH) which in turn controls how much thyroxine is produced. Thyroxine in Apex Thyroxine liquid regulate TSH production in the same way and therefore, substitutes for a lack of endogenous thyroxine (produced by the thyroid gland). What does Apex Thyroxine contain? Apex Thyroxine Tablets contains the active ingredient thyroxine sodium 0.4mg, which is used to treat hypothyroidism, a deficiency in thyroid hormone, in dogs. Apex Thyroxine Tablets 0.4mg contain thyroid hormone (thyroxine) which is used to treat hypothyroidism dogs, a condition in which the thyroid gland does not make enough thyroid hormone needed to regulate growth and metabolism, and in dogs is usually due to atrophy of the thyroid gland. Symptoms include loss or thinning of the fur, dull hair coat, increase shedding of hair, weight gain, lethargy, reduced activity, increased sleeping and reduced ability to tolerate the cold, thickening of the skin, increase susceptibility to skin infections and drooping face muscles. Thyroxine in Apex Thyroxine Tablets 0.4mg interact with a specific receptor inside cells to stimulate proteins needed to manage and regulate a variety of processes including how your dog’s body regulates temperature, metabolises nutrients and controls growth and development. The overall effect of thyroxine is to Increase rate of metabolism. Apex Thyroxine Tablets 0.4mg are a hormone replacement therapy for dogs that will restore your dog’s hair coat, improve your dog’s skin condition, and help restore your dog’s energy, weight, strength and general wellness. What are the side effects of Apex Thyroxine? The most commonly reported side effects when your dog is taking Apex Thyroxine Tablets 0.4mg include polydipsia (increased thirst), polyuria (increased urination), polyphagia (increased hunger), reduced heat tolerance and hyperactivity or personality change. When should Apex Thyroxine not be used? How should Apex Thyroxine be given? You should give your dog Apex Thyroxine Tablets 0.4mg twice daily 2-3 hours before a meal, at the same times each day. The dose given should be 0.1mg/10lb (4.5kg) body weight, which is equivalent to one tablet for each 40lb or each 18kg body weight. The dose may be adjusted by your veterinarian depending on your dog’s thyroxine blood levels and maintenance dose may be adjusted to once daily. You can give your dog Apex Thyroxine Tablets directly into their mouth or added to your dog’s food, but this will reduce its absorption and you may need to adjust the dose, depending on the recommendation of your veterinarian. The effects of Apex Thyroxine Tablets should be seen within 6 weeks and you should continue to give Apex Thyroxine Tablets for as long as recommended by your veterinarian, which may be long term. How long should you give Apex Thyroxine? You should continue to give Apex Thyroxine Tablets 0.4mg for as long as recommended by your veterinarian, which may be long term. If you miss a dose of Apex Thyroxine Tablets 0.4mg give it as soon as you remember, unless it is time to give the next dose, then skip the missed dose. Do not give a double dose. How should Apex Thyroxine be stored? You should store your Apex Thyroxine below 30°C in a cool dry place and protect from light.